To help the government fight the funding of terrorism and money laundering activities, federal law requires financial institutions to obtain, verify and record information that identifies each person or business entity who opens an account. This notice answers some questions about Cabrera Capital Markets Customer Identification Program. You may also need to provide a copy of your driver’s license or other identifying documents. A corporation, partnership, trust or other legal entity may need to provide other information, such as its principal place of business, local office, employer identification number, certified articles of incorporation, government-issued business license, a partnership agreement , a trust agreement or other documentation that establish the legitimacy and authority of a business entity. U.S. Department of the Treasury, Securities and Exchange Commission and FINRA rules already require you to provide most of this information. These rules also may require you to provide additional information, such as your net worth, annual income, occupation, employment information, investment experience and objectives and risk tolerance. 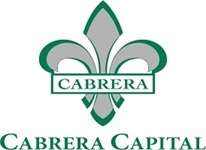 Cabrera Capital Markets may not be able to open an account or carry out transactions for you. If Cabrera Capital Markets has already opened an account for you, we may have to close it.